Patented Fold Flat mechanism allows them to be folded flat to 10mm even in their protective case. As a part of the fold flat range Nannini also provide fold flat Computer Monitor Glasses. 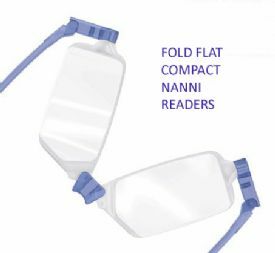 ​​​​​​​Why not try the new fold square Nanni Range? Still only 10mm in thickness these really do fold into a neat square pack that fits into your front trouser pocket or purse.